Update: Somehow this post was deleted. I’ve been reading through “Barbecue! Bible : Sauces, Rubs, and Marinades, Bastes, Butters, and Glazes“, by Steven Raichlen, quite often lately to gather a few ideas for recipes to use with smoking or grilling. One of the recipes in the book is a parsley-garlic chimichurri recipe that I’ve probably passed a few hundred times but never really looked back on since day one. Nothing is wrong with it, mind you, and it’s not one of those ‘add chopped chiles to ketchup for an authentic sambal type of recipe that often loathe. 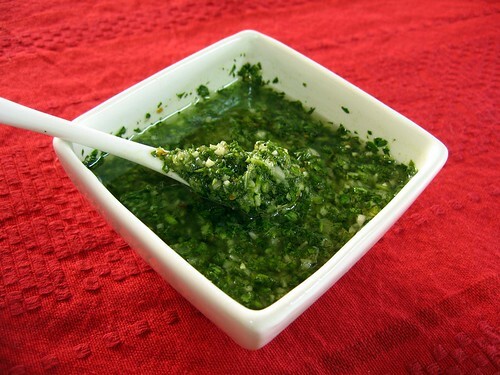 This chimichurri recipe looks as authentic as any. I’ve seen mirrors of it in Argentina and that’s part of the reason why I never gave so much as another glance–nothing new. Sure it is different from my parsley-garlic version in that a little minced onion and a pinch of oregano are added to the mixture, but I’ve added those ingredients before, only in different proportions. About a week ago, while trying to perfect my signature spice rub, all sorts of thoughts about proportions where swirling around my head while thumbing through Steven’s book. When passing the chimichurri recipe for the 436th time, I thought about trying it out with his exact proportions. Maybe this version makes one heck of a chimichurri. Well, I made it. The outcome? Delicious. The “less is more” mantra definitely applies to the small amount of onion and oregano. Although, I did have to decrease the oil and increase the vinegar just a bit, but I’ll explain that in the recipe. Chop up the parsley a bit. This will make processing easier. Add parsley and garlic to food processor and hit the pulse button a few times to mince. Add remaining ingredients and pulse some more. Slowly pour oil through the chute, while taping away on the pulse button. Pulse just enough to where everything is mixed properly. When I stopped, the oil was just starting to emulsify, and that happened very quickly. I don’t find emulsification aesthetically pleasing with chimichurri. If you like the fresh crisp flavor of parsley, use immediately. Letting it rest overnight will balance out the flavors. Don’t just use this recipe as a table-side condiment, the opportunities are endless. Use as a marinade. Use when cooking fish. Use with roasted vegetables. Also, a few spoons added to a basic salad vinaigrette works wonders as well. 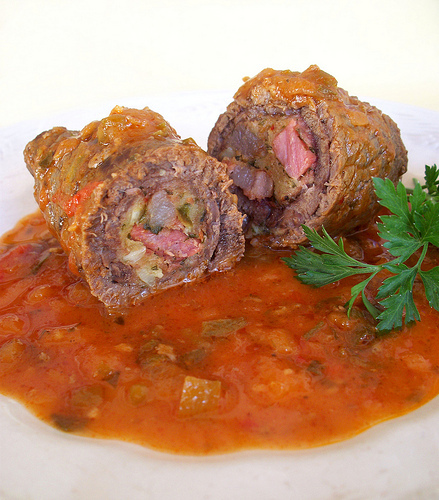 I have another chimichurri recipe posted here. If you are unfamiliar with Steven Raichlen, he’s an award-winning author of numerous books, tv host, and teacher who practically lives and breathes all things related to barbecue. So much so, that he even traveled extensively around the world for four years to learn what barbecue means to everyone else. Just a note to anyone wondering why old posts are appearing as new and some posts are missing: The site has had some issues with the database and about 20 posts were dropped. Luckily the majority of those were in categories not really relevant to the main focus of the site but I do want them back up. If I can’t restore them through the db, I’ll just re-add them as if they were new. Quick Summary: Grilled steak with chimichurri is not called a gaucho steak in Argentina.